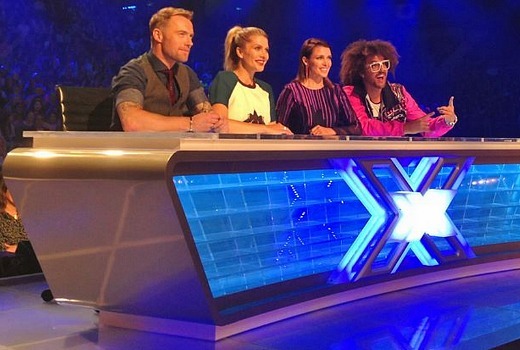 The X Factor will launch next Sunday night, according to a media report today. News Corp reports Seven will launch the show at 6:30pm on Sunday July 13, in place of House Rules. It continues Monday and Tuesday nights at 7:30pm. However the article “Kyle and Dannii Minogue in prime-time TV battle” has a handful of errors in it, aside from the headline typo. Firstly, it incorrectly states the Minogue sisters will go head to head, when in fact it will launch against The Voice: Kids, minus Kylie (presumably they will be head to head on night 2). It also states “Not since Young Talent Time, which was screened on Channel 10 in the 1970s and ’80s, have we seen the Minogue sisters share the Australian screen.” Technically they won’t actually be sharing the screen, they are on opposing networks. In any case Kylie actually joined sister Dannii for The X Factor only last year, assisting her with her choices in New York. Both were also guests at the 2014 Logies and 2011 ARIAs -the same show. Still, you have to admire Seven’s confidence in taking on Nine’s singing juggernauts for their audition episodes. Ensuring viewers are connected to talent from their first appearance has proven crucial to talent shows. Don’t expect Nine to take this laying down. Waiting for the Y Factor to start!Not a good Chef,Housos Vs The block.The last one I would watch. Both of Harrison Craig’s albums (More Than A Dream & LOVE) peaked at #1 on the AU charts (and the first in NZ aswell). Nooooooooooooooooooooo ! When will these interminable talent quests ever end???????? Considering giving a one episode try of x factor. Haven’t watched it since channel 10s failed attempt at x factor all those years ago. At least it has two Aussie judges which the voice fails at. Did not watch the voice this year as last year wasn’t great.The thing that puts me a little off x factor is how young some of the singers are and that it tends to skew younger than the voice does. Have no interest in the voice kids. Too young. Why do you think Nine bought in The Voice Kids? I think they bought it in the combat the fact that X Factor has contestants as young as 14. I love The Voice & I think Voice Kids has been outstanding so far. As for X Factor wildcard. if it is like the US version it is just like the American Idol save where they can save 1 contestant from elimination. I predict the Voice to keep doing really well & I can’t wait for The Block. I usually watch X Factor but hate the audition process as you have all the dross that you don’t get on The Voice. Good thing there are TV catch up sites. I liked the Voice Kids because it was more fun to watch than the ordinary Voice although I loved the coaches for this years voice (Ordinary Version). But I don’t really like the contestants. They are too ordinary and the live shows are not that dynamic. I like X-Factors format better because the Auditions are more surprising believe it or not. Also the finals are more easier to understand and more dynamic. Its 1 contestant going home per week rather than 4!!! Also all the judges have a say in who goes home. But 1 thing I am really annoyed at is how many singing shows there are!!! Its really annoying now. 1 version of the voice is enough. We all saw what happened when there was more than 1 version of masterchef!! I am glad AGT is gone for now. The less Singing shows the better. clearly wanting to get in before the block, very clever from seven! x factor is a proven ratings winner, and sevens promotion for the new season has been outstanding. Nine won’t be happy! So true – Was playing “So Fresh – summer 2014” for the kids today – there are 3 tracks there by artists from the X Factor, 1 from AGT and 1 from Australian Idol. Nine from The Voice. I recall Karisse Eden – winner of first season of The Voice saying she was going to take it easy after winning – pretty sure she so far still hasn’t done anything and will be forgotten by many. As for last years’ winner – I don’t even remember who they are! The X-factor won’t have a chance! I’m definitely more a Voice fan with much better coaches such as Kylie & Ricky. The X-factor is getting tired and I’m not sure about the Judges on the show I mean when was the last time any of them came up with new singles etc? The Voice is more fresh and with a much better format! Chart sales are not everything but last I check X Factor singers are doing much better there than The Voice. The Voice is yet to deliver a star. This is scary programming by Seven. I love The X Factor and will be watching it as i couldn’t care less about The Voice but its a huge huge risk which could backfire big time. I hope it doesn’t but 2 singing shows (well 3 really as there is 2 formats on Nine) going head to head never ends well for one of them. Ratings next Monday will be interesting to see. X Factor usually starts last week of July. Its actually 2 weeks earlier this year. Premiered on 29th July last year which was around the time i was expecting it this year which makes me think we have an extra 2 weeks this year. Must be that wildcard thing they’re talking about. I prefer Xfactor and Dannii. Kylie is a great performer but Dannii keeps it more real. Seven know they will win, and that’s why they have decided not to wait. The ratings for The Voice keep dropping to new lows each week, and Seven have their core audience that were watching House Rules that will probably switch to X Factor. I think MasterChef could also rise now that House Rules is over and it enters its final weeks. Great! Have been waiting for X Factor, The Voice has lost me this year, just can’t warm to any contestant, and Kylie is annoying. Team Dannii all the way. Haven’t we run out of singers yet? I know there are many who frequent this site who do not understand the appeal of pay TV but as someone who does not enjoy reality, this is why I love any other option. All year it seems like there is just one completion after another and decent shows get shoved around the schedule and starting up to a half hour late. FTA needs to stop holding on to so many titles they won’t use and on sell them so at least someone can enjoy them! It would be strange where 7’s X Factor have to go against Nine’s Big Brother and The Voice Kids. That was similar to last year where this show went against AGT. What about The Amazing Race AU vs NZ? Wow, how much longer has The Voice to run? as this only airs one day per week now and The X factor normally runs 2 or 3 to start with, it will be interesting to see the outcome, I am personally a fan of X Factor, I like the format more and also the more diverse acts in solo and groups, so I hope it does well. I predict X Factor will get crushed. We saw what happened with Masterchef Professionals against MKR last year.